I'm planning a little tour of some parts of Manila that figured in the battle. I've already contacted fots2 on this. Tentative date: 6 November 2010. Scottish Masonic Temple (ISTR that this was another place that figured in the battle, just can't quite put a finger on it... ISTR - I think - that some Jews were sent here on their way to Shanghai in 1940 I think). I'll be ironing out the details and making arrangements to make the trip as smooth as possible (read: secure permission to roam around and take photographs). I'll be bringing a van that can accommodate 12 passengers (I'll be driving). Baluarte de San Diego - Japanese 120mm Type 10 still there. Thanks for the list BB! Last time I toured Fort Santiago, it was in 2006. I did notice a lot of shells on display there, alas not much in the way of labels at that time. Plaza De Roma- formerly Plaza McKinley until the 1960's. Known as Plaza Mayor during Spanish times--- was the site of Bullfights and other public events. It is located in front of the Manila Cathedral (were all the aged trees were recently felled by "mistake"). Intramuros- It is possible to walk around the walls and see the various gates- visit the visitors information center in or near Fort Santiago for information. 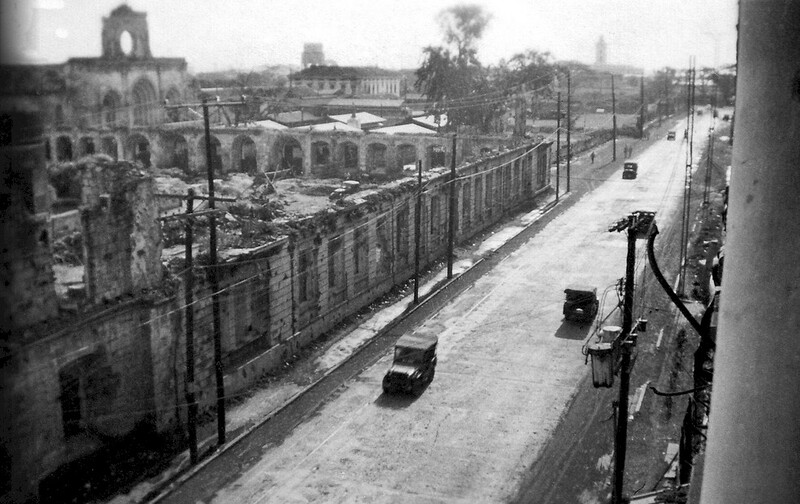 While on the walk, or drive, look for the war damage still visible on some of the walls and buildings inside Intramuros. Safety an issues on a walk inside the walls? One building I remember in particular was near the Immigration building adjacent to the Pasig river, still in post war shape. Also in Intramuros visit the Monument to the 100,000 Filipino's killed by the Japanese in 1945 in the retaking of Manila, Intramuros in particular. It is located on the street between the Manila Cathedral and San Augustin. If you pay for the visit to the Spanish museum inside San Agustin, worth the small price, (bathroom inside of unknown age, but clean, always want to know were the good bathrooms are), if you go out the back door you can see some of the exposed brick work from the former school that was destroyed in the bombing of WW II. You will have to look close, as a huge new building has been built on most of the old ruins. I believe you can see it best from the upstairs room in the museum with the massive table and a rendition of the entire former San Augustin complex under glass. On the same street as San Augustin, proceeding towards Rizal Park, park your van inside the Illistado, (spelling) you drive through the building and park inside, there is a small but excellent cafe with the best halo halo in Manila, also pastries and cakes, sandwiches. (clean bathrooms), a good break. The best Philippine crafts can be found in the same complex. This complex was destroyed during the war. Thanks guys for the suggestions. I have always wanted to do a detailed walk around Intramuros. Hopefully that will happen soon. Nice shot of Plaza De Roma fots. No sign of any bulls running around.........few trees in Plaza De Roma then. Also want to do a complete tour inside of Intramuros some day. My personal walking tour over the years has been limited to --- Starting at Fort Santiago, ( great banana Q on a stick by exit) down the street past the Cathedral, past San Augustine on the same street, and out of Intramuros and into Rizal Park. We took photos, I'm in the process of, ah, processing them. Not much, but it'll do I hope. This'll be a continuing project. The Phantom, we were along the street I think, alas we didn't get pix from that vantage point. Fots and I would like to go back for a more extensive visit, so there's a chance a "now" version of that pic would be taken in the near-ish future. Salamat for the tour yesterday. There is no way I would have gotten into Rizal Stadium or De La Salle without you there. It is always interesting to see the actual locations I have only read about. Is the old Meralco Tegen station still stands today I remember when I was a kid I can always see the smoke stack from our Elementary School in Singgalong. We weren't able to enter Provisor island because the place is said to be now a distillery. I still see the smokestacks though IIRC. Five Manila Points of Interest from recent visits to the city. V523. (01 Manila 5 Points of interest). This is a Google Earth map for the orientation of these 5 Manila points. V524. (02 161213 Gen). Romulo near US Embassy.1. This stature interested me very much; Carlos Romulo played important roles in the Philippine and US History. This monument was worked on before and I wanted to know the present condition. V525. (03 161213 Gen. Romulo near US Embassy.2). Carlos Romulo held many position, wrote many books and was very important to Gen. MacArthur. An anecdote from him to Pres. Truman was: In the Philippine we thought the Gen. was God, in response to the President’s sarcastic remark. V527. (05 161213 Children Museum, Dolphy,Mnl.3). Across the Roxas Boulevard, the former Adm. George Dewey Road, sits the former Elks Club building, built in 1911. It is now the Museo Pambata, a children museum. V528. (06 161213 Children Museum, Dolphy,Mnl.1). In front of the Museo Pambata is a monument to Rodolfo Vera Quizon, Sr. If anyone spent some time in the Philippines he probably heard of him as very popular entertainer and he supported this museum, hence he is honored here. V529. (07 161213 Children Museum, Dolphy,Mnl.2). The biography of the King of Comedy, Rodolfo Vera Quizon, Sr. in front of the former Elks Club building which is now the Museo Pambata, a children museum. I present here the second segment of 3 of the 5 points of interest with 4 images; they are much smaller and they are numbered 01 plus 08 to 11; the subjects are Army-Navy Club, Pres. Quirino and Pier 7. V530. (08. 161227 Mnl. Ocean Park.19,Pier 7). My daughter and I visited the Manila Ocean Park at Luneta and three other items aroused my interest. The first pier is the Eva Macapacal Super Terminal. The next pier must be the historical Pier 7 in Manila. I see a Phil.-Navy landing ship. V531. (09. 161227 Mnl. Ocean Park.31). At the pedestrian entrance to Manila Ocean Park is a monument for President Quirino. I was familiar with him because I had visited a museum dedicated to him in Vigan. V532. 10. 161227 Mnl. Ocean Park.33,Pres. Quirino. A close-up of the last picture. dedicated to the former President Quirino. The description is in Filipino. V533. (11. 161227 Mnl. Ocean Park.34,Army-Navy). The Army-Navy Club is being renovated with a big crane and all. It is going to be a 5 Star hotel. It was a museum before and it was not taken care of. There are over 100 images, so I will develop this project in stages; here are the first 11 images! V653. -Image at the entrance to the Rizal Shrine! V654. -Instructions at the entrance to the Rizal Shrine! V656. -1 of 8 images of 6 significant events in the history of Dr. Jose Rizal! V657. -2 of 8 images of 6 significant events in the history of Dr. Jose Rizal! V658. -3 of 8 images of 6 significant events in the history of Dr. Jose Rizal! V659. -4 of 8 images of 6 significant events in the history of Dr. Jose Rizal! V660. -5 of 8 images of 6 significant events in the history of Dr. Jose Rizal! V661. -6 of 8 images of 6 significant events in the history of Dr. Jose Rizal! V662. -7 of 8 images of 6 significant events in the history of Dr. Jose Rizal! V663. -6 of 8 images of 6 significant events in the history of Dr. Jose Rizal! V664.This is one of 3 images about the dancing rings, Olympic Symbol at the Rizal Park in Manila. V665. This is the third of 3 images about the dancing rings, Olympic Symbol at the Rizal Park in Manila. V666. This is the Luzon Island Km Marker Zero at the Rizal Park in Manila. All distances on Luzon are measured from the marker. There used be an ordinary Km Stone Zero a few years ago. V667. This is a view of the Quirino Grandstand in the Rizal Park. This one was built after the US granted the independence to the Philippines on the 4th of July 1946. The 4th of July 1946 Grandstand was closer to here and was demolished later. V668. This is one of 6 images about the Rice Garden at the Rizal Park in Manila. It is located near the Manila Hotel. V669. This is the 3rd of 6 images about the Rice Garden at the Rizal Park in Manila. It is located near the Manila Hotel. V670.This is one of 6 images about the Korean-Philippine Friendship Trees Marker at the Rizal Park in Manila. It is located near the Manila Hotel. V671.This is the 3rd of 6 images about the Korean-Philippine Friendship Trees Marker at the Rizal Park in Manila. It is located near the Manila Hotel. V672. This is one of 5 images from the Manila Hotel; it is next to the Rizal Park in Manila. V673. This is the 2nd of 5 images from the Manila Hotel; it is next to the Rizal Park in Manila. V674. This is the 5thof 5 images from the Manila Hotel; it is next to the Rizal Park in Manila. Vow, I remember now the uproar in the news, vow, it is now 20 years ago. I believe foreign interests wanted to buy the hotel and had plans to change it substantially. Many people remembered, that the hotel played a great part in the Philippine History and wanted it be preserved the way it was! V675. This is a map of the Rizal Park in Manila and the locations of the last 8 items in this album have been marked on it. In this forum presentation I am uploading 19 of those 47 images, there is no description because the images tell the story. Remember these images were shot in the Rizal Shrine on Fort Santiago in Manila. If you have a chance, visit the Rizal Shrine!!!!!!!!! Very nice presentation. I visited there in 2011, and it was worth the visit. For me, two things really stuck out for me. 1) In the re-enactment of his execution in the park nearby (statues twice normal size, very impressive) I just could not get over the fact that they tied his arms behind him, turned him around and then the firing squad SHOT HIM IN THE BACK! I just could not get over that. I kept thinking about it,,,, for days. It seemed so cowardly in some way. There was a depiction of this in mural size on a wall in the shrine. Did you happen to see it? Is it just me or did that fact strike anyone else as,,,,, I am struggling for a word here,,,, outrageous? 2) Dr. Rizal was very much a pacifist. He did not want the revolution to be violent and fought very hard to keep it peaceful yet it was his martyrdom that sparked that violent revolution. This and all the images in this album were shot on the 7th of March 2017 and it is an exhibit in the Rizal Shrine, located in Fort Santiago, Manila, Philippines. This is the album URL but it is only the start right now. 26 images have been added and they describe his cell in Ft. Santiago, the trial and execution, the burial and following disposition of his body and the 1911 drawing of his execution. In this forum presentation I am uploading 5 of those 26 images, there is no description because the images tell the story. Remember these images were shot in the Rizal Shrine on Fort Santiago in Manila. If you have a chance, visit the Rizal Shrine!!!!!!!!! This and all the images in this album were shot on the 7th of March 2017 and it is an exhibit in the Rizal Shrine, located in Fort Santiago, Manila, Philippines. This is the album URL; this is the second last segment. 14 images have been added and they present large images and descriptions in the stairway of the Rizal Shrine. The museum calls it:”Postscripts to the Rizal Story”. In this forum presentation all 14 images are shown. The large pictures have been reduced in size. There is no description because the images tell the story. Remember these images were shot in the Rizal Shrine on Fort Santiago in Manila. If you have a chance, visit the Rizal Shrine!!!!!!!! !